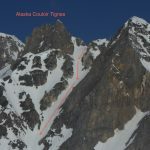 Alaska (the name that the Brits have given) couloir is an impressive couloir which is rarely skied as it is difficult steep off piste skiing and difficult to get to. It stands out and is visible from the Palafour chairlift which runs from Le Lac in Tignes. It is for the Advance/Expert skier. 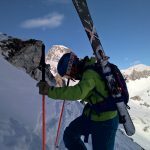 There are two possible entrances which are both achievable in the right conditions which involve some ski touring and boot packing up. A friend had climbed from the left side and skied into it the day before. Conditions were said to be stable. We had decided to attempt the classic route and to boot pack up from the back of the couloir which is North facing and then to ski down the south facing pitch in the race against time before the snow conditions deteriorate, We had estimated to be skiing down at the latest 11.45am. Due to the lack of snow on the obvious ridge line to go to Alaska we were forced to take a different route. On the top of Aiguille Piercee chairlift we hiked up to the ridge and skied down on a high traverse at the top of the Sache as far as we could then skinned up the flat to the shadow of the Alaska Couloir. The skinning up was more challenging without crampons as there was a hard layer and underneath the surface, snow was breaking away. As the slope increased to more 35 degrees it was getting a lot harder to kick turn. We then we booted up for an hour breaking tracks vertically to the summit. We were behind time and in a race against time. As we boot packed up the snow was changing all the time from stable conditions to layers of depth hoar which was hard to make a foot hold in as you were sinking down to the bed surface. 5m from the summit I was confronted by a an iced corniced and without crampons and ice axe the risk was doubled. With this difficulty and behind time I decided to go on no further and to ski down the same route that we had climbed. Alaska will be there for another day.